I've said it before and I'll say it again. 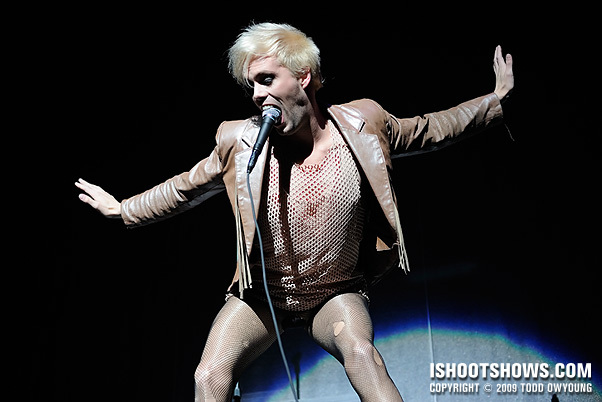 Semi Precious Weapons are my favorite band to photograph. From sweaty, grimy basement dives to the gilded halls of the 5,000-capacity Fox Theater last night, SPW always brings the rock show. As the first act of the night, SPW did a killer job hyping the already buzzing crowd for Gaga. 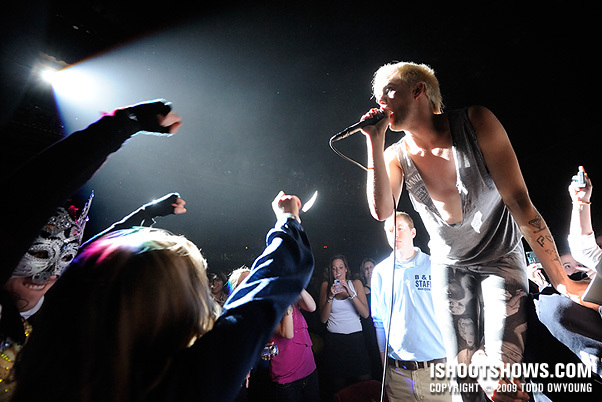 Singer Justin Tranter wasted no time with the crowd participation, causing three small riots during the band's short set as he went into the audience. Seeing Semi Precious Weapons getting a huge reaction from Lady Gaga's fans at the show was a big kick. I'm absolutely thrilled to see Semi Precious Weapons getting 30 minutes of Fame every night with Lady Gaga, and it's hard to think of a better way to start off 2010 than with this gig. For more photos of Semi Precious Weapons, check out photos of their show at the Blender Theater at Gramercy, which was one of Top 10 Concerts of 2009 (if you twist my arm, I'm calling it #3). You can also see the promo shots we did in NYC here. SPW's new EP drops January 19. When I saw Justin’s comment about STL on FB, I immediately came here b/c I just knew you would have shot them in their swing through via the gaga tour! Thanks for the kind words, glad you found these photos. I couldn’t miss SPW on this tour and am really happy for their success. They’re not only great subjects on stage, they’re all great folks as well, and it was really nice to see them again. Hope you have a chance to see/photograph Semi Precious Weapons again soon! Like Elisa said – these photos are the reason I will keep Semi Precious Weapons on my photography radar. Having a favorite band to photography makes the job that much more fun. My favorite is Roger Clyne and The Peacemakers – keep them on your radar for 2010. Thanks for the heads up, will try and watch out for those guys. My favorite shows with SPW are those packed with a few hundred people and the band on a two-foot stage with fans doubled over the monitors trying to grab Justin, but I loved seeing them on the big stage of the Fox last night. Hope you get to see and photograph SPW soon. I hope I get to shoot them again too Todd! Yup, Justin – and everyone else in the band – is great. I wish I could have caught the Sounds/SPW tour – sounds like a great combo. It’s been too long since I last photographed the Sounds. hey todd, did you get approved for Gaga? your SPW photos are always quite surreal….they always are the ones that really capture my attention…i feel like once you are connected in some way with a band, those images always show the photogs enthusiasm shooting them and the artists knowing that you do great work and make them look even more “rockstar-ish”. No photography was allowed for Gaga. I always love photographing SPW – and they love to be photographed, so it all works out. Having a connection to a band certainly never hurts, that’s for sure, and I was happy to see the guys again. blanket press lockout for gaga? That’s correct. It’s a pity, because the show’s production is amazing. The first several songs aren’t much to shoot due to Gaga performing behind a screen for a good portion and there being lots of haze, but after that it would have been fantastic to photograph. Wow! That guy really knows how to pose! Must be awesome to work with these guys! Justin is a natural, though I’m sure he might well say that he simply willed himself to be a rock star, too. Thanks for the comment, I’m glad it’s so clear why Semi Precious Weapons are some of my favorite subjects. Thanks for the comment. I love these guys – they’re the coolest. Cole is a great guy, absolutely. Hoping to see those guys again soon.